Jim Bunning of Kentucky is leaving the Senate in much the same way his predecessor did. Twelve years ago, Bunning's decision to seek the office persuaded Wendell Ford, the former governor and, at the time, the longest-serving Kentucky Senator, to retire. Standing in a gallery just off the marbled floors of the Kentucky capitol, Ford told a crowd of weeping supporters in 1997 that the prospect of raising $100,000 a week to be competitive in the next year's race had persuaded him to make his fourth term his last. "The job of being a U.S. Senator today has unfortunately become a job of raising money to be re-elected instead of a job doing the people's business," he said. In a trademark bit of humor, he added, "Mrs. Ford won't let me bring anyone home to sleep in our spare bedroom." On July 27, Bunning made a similar statement, but without the humor. "Unfortunately, running for office is not just about the issues," said Bunning, the baseball Hall of Famer known in Congress for being as stubborn as an angry umpire. "Over the past year, some of the leaders of the Republican Party in the Senate have done everything in their power to dry up my fundraising. The simple fact is that I have not raised the funds necessary to run an effective campaign for the U.S. Senate." The notoriously irascible and unpredictable Bunning finally bowed to the one immutable reality of Kentucky politics: Republicans can't win without the support of Mitch McConnell, the Senate minority leader who has long since surpassed Ford as the state's preeminent politician. For months, McConnell quietly raised doubts about Bunning's intention to seek a third term, doubts that proved to be more than enough to dry up his contributions. In doing so, McConnell was showing the same unsentimental single-mindedness that he has always displayed. A feud between Senators from the same state and same party is rare, but McConnell plays to win. "The Republican leadership was responsible for drying up his funds. Jim is right about that," Ford, a master of the Senate in his day, told TIME. "But McConnell was focusing on winning or losing. Republicans have lost the last two elections, so McConnell has been losing his taw, as we would say in western Kentucky, and he doesn't want to lose anymore." More recently, Bunning practically predicted the imminent death of Supreme Court Justice Ruth Bader Ginsburg after she was given a diagnosis of pancreatic cancer, though he subsequently apologized. Meanwhile, Kentucky has gotten a little less red in recent years, even as Bunning has remained one of the most conservative Senators. Louisville now has a liberal Democrat in the House, and the Republican governor whom McConnell helped elect in 2003 was roundly defeated four years later. Bunning's conservative credentials  buoyed of late by his opposition to the stimulus package, Supreme Court nominee Sonia Sotomayor and, especially, the Wall Street bailout  would have stood him in good stead in a primary, but observers on all sides of the fence predicted he would have struggled in the general election, which has already drawn two strong likely Democratic contenders, Mongiardo and attorney general Jack Conway. With every vote critical in the Senate, where Democrats already have a 60-seat, theoretically filibuster-proof majority, McConnell decided that saving Bunning's political hide once  his last-minute help in Bunning's 2004 squeaker made the difference  was enough. He quietly signaled to Republican moneymen that they ought to wait Bunning out. Party leaders in Washington met with a potential primary opponent. The tension reached a boiling point when Bunning called Senator John Cornyn of Texas, who will lead efforts to re-elect GOP Senators in 2010, a liar after Cornyn denied he was recruiting an alternative candidate to Bunning. Just for good measure, Bunning also threatened to sue the party if it did indeed recruit a candidate to run against him. McConnell's strategy ultimately worked. Bunning raised just over $300,000 in the second quarter of this year, less than McConnell himself, who won't see re-election for five years, and less than Trey Grayson, a Harvard lawyer turned secretary of state who had not yet even officially announced his candidacy. Before the ink was dry on Bunning's statement on Monday, Grayson fixed that technicality, announcing he was in the race, and for keeps. He'll likely have competition, however. Rand Paul, a physician from west Kentucky and the son of Texas Congressman Ron Paul, told TIME on July 28 that he is close to deciding to make a run for the now open seat for U.S. Senate in Kentucky. "I am leaning that way, and I will have an announcement within a week or two," he said. Whoever the opponents are next year, McConnell's maneuvering has erased any doubt who is in control of almost all things Republican in the Bluegrass State. 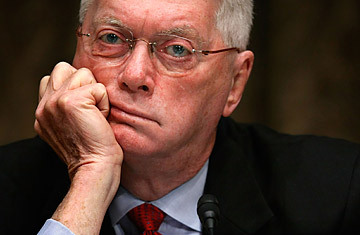 But there remains a wild card: McConnell is certainly not in control of Jim Bunning. And by forsaking a third term, Bunning gains something else: he's now officially a man with nothing to lose, which to McConnell must be a scary thought. See pictures from the White House photo blog.